install in less than 1 hour! 32 models to choose from! We ship from NY state, no sales tax! After more than 10 years in the custom stair building trade, Claude Ranger and colleagues started framing stairs with custom made light gauge steel stringers back in 1999. They went on to create, patent, manufacture and distribute the Stairframe system, to great reviews (*) and 100% customer satisfaction with never a product returned, not even a call for assistance. In 2007 Claude Ranger J.S. 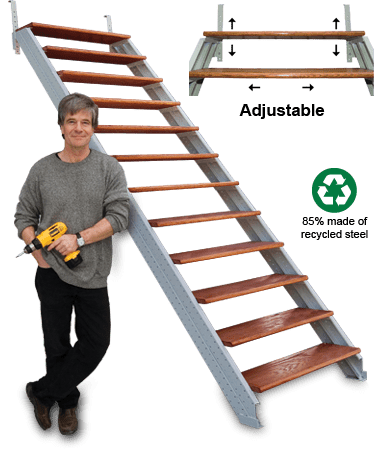 (Job Supply) launched WORKSTAIRS re-usable jobsite stair stringers, designed to replace wooden construction site temp stairs (that usually fall apart after 3 or 4 jobs and end up in the dumpster creating needless landfill waste) with an 80% cost and time saving hands-free alternative to ladders and scaffolding. Many have said that the quick and easy to move OSHA compliant WORKSTAIRS should be mandatory on all building sites if only for safety and environmental reasons. Both building professionals and do-it-yourselfers were quick to discover that WORKSTAIRS offered more than a jobsite solution, but also a fail-safe basic stair building product for all, that we re-branded: Fast-Stairs. The recent introduction of middle slide connectors into the engineered stair stringers now allow easy shipping of modular, free-standing (no walls), solid, full-size stair frames. Nothing fancy; just basic, function-designed, versatile, dependable products which enable you to quickly assemble your stairs with the stair parts you choose, from 2x’s to the best hardwood and other fine stair finish products you’ll find locally. Later, you can customize, even move your stairs. Years of experience in this field have shown us that many customers are looking for the option of having slightly steeper stairs in all kinds of applications, residential or not, in and outdoors, or simply where tight space is an issue (an extra ½ inch on your risers’ height will save you about 4 feet in horizontal run on 13+ step stairs). Only we offer this option with ready-made, pre-fab products. Today, only Claude Ranger J.S. offers economical direct buying and shipping of engineered steel stair stringers guaranteeing fail-safe fast stair building to North American customers everywhere, still 98% satisfied. "The stairs worked out very well... assemble better and faster..."
"One of the best new products on the market today." "Your stairs are great, easy to install. Just ordered another set for another house." "Claude, you have been an excellent person to work with. And man-o-man what a set of stairs. They are so strong and so easy to put together. Thank you and Fast-Stairs." "The product was fantastic and have told many people about it and would not hesitate to purchase again in the future."